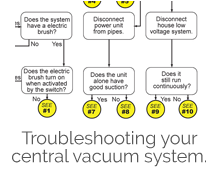 How Does a Central Vacuum System Work? What is a Central Vac?. At the core of the system is the central vacuum power unit. 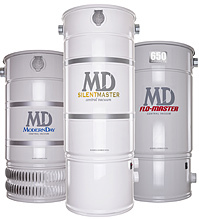 A powerful motor provides strong suction and deep cleaning, while the filter separates debris. The vacuum unit is located in a remote location such as the garage or basement. The vacuum motor pulls air through the pipes and hose, and all the dust, debris, paper, hair, coins, and even small toys accidentally vacuumed are captured and retained in the filter. The exhausted air then is quite clean and is either vented outside or within the area. Depending on the type and capacity of the filter used, it should be replaced every three months to a year. The vacuum is powered on when a vacuum hose is inserted into an inlet within the home. See MD's Power Units. Filtration. Disposable or permanent filters. Power. 110 or 240 volt. Units available for every size home. Quality. Metal or plastic, name brand components or not. Sound. Ranges from loud to conversational noise level. Central vacuum hoses are lightweight, flexible, and crushproof. They come in a variety of lengths, and are the only part of the system taken in hand throughout the home and can be used to clean any surface of the home. Traditional Vacuum Hoses: The long hose has two ends. The wall end gets plugged into one of the vacuum inlet ports throughout the home. Some hoses are designed to cause the suction to start immediately when plugged in. Other hoses are fitted with an on/off switch for the suction on the handle end of the hose. Hide-A-Hose: This hose is contained in the pipes of the system until it is pulled out for use. When done vacuuming, the hose is retracted back into the pipes by the suction of the vacuum. Traditional and Hide-A-Hose available in many lengths. Traditional hose systems can use a variety of hose types. Electric hose (traditional style) powers electric vacuum head. Hide-A-Hose available with and without on/off handle switch. Vacuum Pipe connects the main unit to the wall Inlet Valves. The inlet valves, or ports, connect to the hose and enable the suction to be turned on and off. 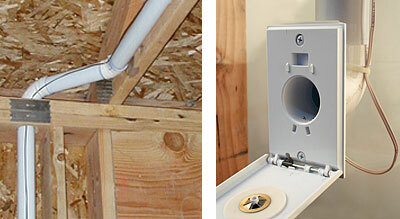 The two-inch diameter PVC pipe begins at the main unit and splits off into different areas of the house. It goes into a wall and connects to the back of an inlet. One inlet can cover a lot of area, sometimes over 1,000 square feet. A Hide-A-Hose inlet with a 50-foot hose can cover 2,300 square feet. Traditional inlets are available with 110 volts for the use of powerful carpet cleaners; Hide-A-Hose does not have that option. All inlets have a low voltage wire connected that turns the suction unit on-and-off. Traditional inlets come in a variety of colors and styles. Traditional inlets available with a 110-volt connection. Hide-A-Hose inlets come in three colors. Hide-A-Hose inlets are typically mounted higher. 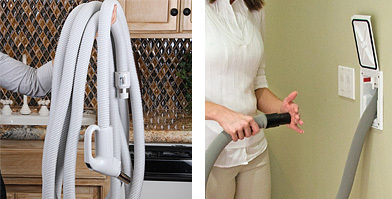 Connecting any of the numerous specialty Vacuum Accessories to the hose allows deep and efficient cleaning on all surfaces of the home. 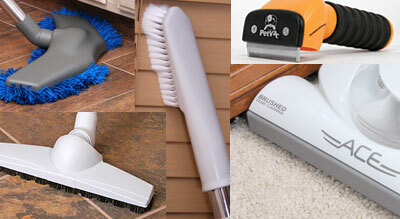 How it Works There are many different types of accessories available for cleaning any surface in your home. The most common are the two types of carpet brush heads: electric and air-driven. Air-driven brushes utilize the suction to spin the turbine that spins the belt and brush. Electric brushes use a motor to turn the brush, which allows the air to be free to penetrate deep into the carpet. Aside from brushes, there are a variety of other accessories that can be used throughout the home for various purposes, such as de-shedding pets, mopping floors, cleaning blinds, vacuuming cars, and more. These accessories can be attached to the hose itself or to extenders if more length is needed. 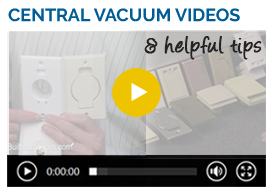 Central vacuum accessories for specific tasks. Complete vacuum accessory kits with vacuum hose. Combination kits of just accessories alone.